Geofluids are instrumental in many aspects of cleaning up the environment: all sorts of small diameter holes are drilled for soil investigations, monitoring wells, venting or injection wells. The choice of drilling fluid is governed by the chemistry of the contaminants and the science being implemented; our range of synthetic, semi-synthetic and natural polymers offers a great selection. 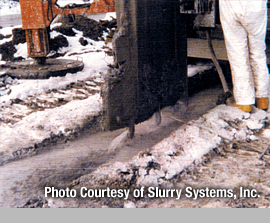 Some states used to allow monitoring wells drilled only with bentonite slurry: talk about icing on the cake! Bad engineering. Extraction of contaminated groundwater over the long term is more economically done with horizontal wells or leachate extraction trenches than with numerous wells requiring energy and maintenance: depending on soil conditions, one of POLYBLEND-B, PREMIUM, as blends or PREMIX, TALGUAR, 3D GUM or POLYMAR™ as pure polymer slurry will be selected. A new application is venting methane out of capped sanitary landfills using a French drain concept consisting in trenching down to the aquifer and backfiling with coarse gravel after placing a synthetic liner on the outside face with well casings placed at intervals and rising to vent 12 feet above ground surface. Trenching with slurry in unsaturated soils can be tricky and requires serious thought in selecting the geofluid. We have developed a trenching method using a discontinuous gel mass as the trench support fluid instead of a liquid-phase slurry. This has the benefit of minimizing losses in very open soils and allowing the filter sand or iron filings sand mixes backfill to be placed in the trench without saturating with slurry and remaining dry until ground water saturation occurs. The gel mass is created with PLUG, swollen ahead of time in storage tanks. Barriers containing migrating plumes of contaminated ground water are of many kinds but generally trenched from 4 to 36 inches wide. The end product must be engineered to provide long term compatibility with the contaminants. The one step construction concept of self-hardening slurry is at home in HAZ MAT where simplicity and worker safety are maximized. With almost universal compatibility with industrial contaminants, IMPERMIX® is the ideal self-hardening slurry that provides ease of preparation, use in the fresh state, very low hydraulic conductivity and substantial strength. These characteristics extend to non-trenched barriers such as the thin vibrated beam wall, jet grouted barriers and Deep Soil Mixed walls. See IMPERMIX® dedicated page for more details. The passive ground water treatment known as Funnel and Gate requires the use of watertight barrier technology (self-hardening slurry) for the funnel and pervious barrier technology (bio-polymer slurry) for the gate (TALGUAR, PREMIUM). The occurrence of such projects is increasing since they offer treatment instead of strict containment.